There does not appear to be anything special about this number. So why was it 88 MPH? Further evidence on wikipedia supports this. The fact it needs to reach 88 MpH may be an indication that the Delorean is supped up, or that time travel is impossible. Or even just it needs to be turned up to 11 to get time travel. It had to be fast enough to be dramatic without being extreme. OghmaOsiris may be right - 88 would completely fill an old style LED display. Eighty-eight has a certain alliterative/poetic rhythm to it. The number 8 is the symbol for infinity rotated 90 degrees. 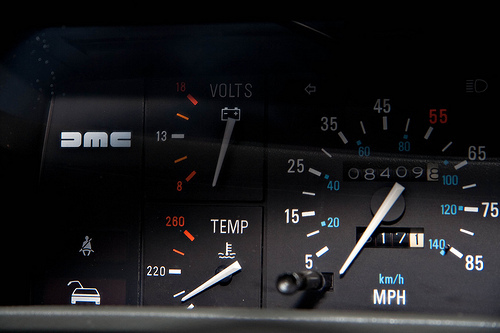 A Delorean DMC-12 is 4216 mm long. When travelling at 88 mph, the car then travels its own length in 4216mm/88mph = 107.2 ms. So this is how long the time-travelling wormhole-thingy that opens in front of the car has to be open, or alternatively the minimum time the flux capacitor is actually in effect. Could this time interval be significant? Note how the Delorean arrives in the same location on earth after travelling in time, but can arrive at different times of day. Assuming it is gravity-bound it must still somehow be able to translate along the circumference of the earth, to correct for Earth's rotation. We know that the time-travel takes place in California, which is at 37 degrees north latitude. If you travel due east from 37 degrees north and circle the earth, the distance travelled is "circumference of earth" * cos(37) = 32 005 km. Now notice that light travels this distance in 32 005 km/"speed of light" = 107 milliseconds! It is then clear that Doc Brown uses the speed of the car to modulate the duration of travel, but in space, not in time. With reference to Minkowski space-time, the car leaves its normal time-like curve for a spacelike but performs a translation in space when passing through its lightcone, where it attains exactly the speed of light. 107 milliseconds affords travel to any point in time while returning to the same point on earth. A round-trip might be necessary depending on whether you travel forward or backward in time. If the car had been at the equator, the car would have to travel at only 70.38 mph. This would actually be a disadvantage as Doc Brown would have to provide more energy to keep the wormhole open for longer. Not that the energy requirements are that large actually. The Delorean is stated to require 1.21 Gigawatts for time travel. Watt is Joule per second and 1.21 GJ/s * 107 ms = 130 megajoules. This is about the energy released by combusting one gallon of gasoline. A gallon per trip makes for good mileage on a time machine. Edit1: As Stephen Collings points out in a comment below, this need to expend energy very quickly also explains why the Flux Capacitor, according to the professor, is so central to the time machine's design. It's not the energy requirements themselves that's the hard issue, but the ability to release it all in an instant, and within the confines of a car no less. Edit2: People ask: Why is it that we account for the rotation of the earth but not the movement of the earth around the sun? Why doesn't the car appear in outer space? Simply put, the law of conservation of energy keep the time-travelling car earth-bound. If you lift an object, it gains potential energy. This energy has to come from somewhere. If you move a car from earth's surface to outer space, it gains A LOT of potential energy. How much? The potential difference between the earth's surface and faraway space is given as GMm/r where G is the gravitational constant, M is the mass of the earth, r its diameter and m is the mass of the car. The nominal weight of a Delorean DMC-12 is 1230 kg, which equates to an outer-space potential of about 77 Gigajoules. More or less the energy expended by a car in a whole year. There is nowhere for this energy to come from. The law of conservation of energy therefore stops the car from translating to outer space. Put another way, the car follows the most energetically favourable path along the 4D spacetime gravity well. Similar to how water flows along bends in a pipe, without spending energy on turning around corners. The fact that everybody says, "Why 88 miles an hour? What's so special about that?" It's easy to remember. That's all. There's no special significance to that. Two reasons. First of all we wanted it to be a speed that somebody wouldn't accidentally drive at. The other thing is, is it's easy to remember. Everybody remembers 88 miles an hour. Maybe you'd remember 89 miles an hour. I don't know, 88 just had the right ring to it. Not covered in the other answers, I believe viewer safety has to be factored in. If they made it lower, it probably wouldn't have been cool enough to take effect. But if they made it higher, they'd run the risk of people actually trying to do it. And honestly, they can't buy the sequel if they're dead. "...the production designers thought it looked cool on the digital speedometer and would be easy for the public to remember." Not the answer you're looking for? Browse other questions tagged time-travel back-to-the-future or ask your own question. 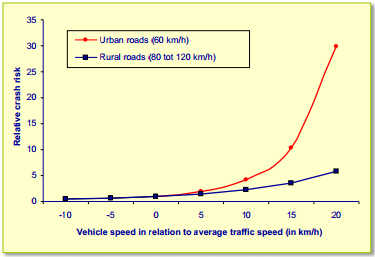 What happens if you exceed 88 miles per hour? Back To The Future Flaw - why don't Marty's parents recognize him in the new future? Why was Marty present in his jump to 2015 in Back to the Future 2? Was “Back To the Future” the breakthrough of mainstream Time-Travelling science fiction in Hollywood? Is Back to the Future flux capacitor a capacitor in the first place? Why was the DeLorean in Back To The Future not always covered in ice after time travel, and why didn't it fly in 1885? Back To The Future: Why should Marty fade at all?